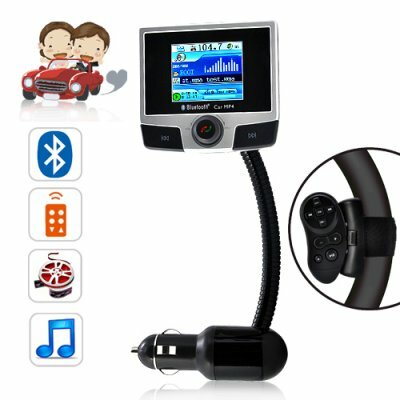 Successfully Added Bluemax Car Bluetooth + MP4 Player with Steering Wheel Remote to your Shopping Cart. Introducing the Bluemax Car Bluetooth + MP4 Player with Steering Wheel Remote Control - meet the safest and smartest way to listen to music, answer calls, and watch movies in your car. It's never been easier; the Bluemax Car Bluetooth + MP4 Player works straight out of the box by plugging right into your car's cigarette lighter charger and gives you instant access to music and movies in your car and on the go. Also with the easy-access steering wheel remote control and wireless earphone, you can keep your hands on the wheel and your eyes on more important things, like the road and oncoming traffic. Amazing Music: If you want a better way to enjoy your music while you drive, then look no further. The Bluemax Car Bluetooth + MP4 Player comes with a FM transmitter that lets you play your own selection of music directly through your vehicle's stereo system or car DVD player. Best of all, you get top-notch sound quality thanks to advanced DSP technology, noise/echo suppression, and handy equalizer settings! Movies Anytime: Waiting to pick up your kid at school? Stuck in a traffic jam on the way to work? Need something to do in the car while waiting for your blood alcohol content to drop back down? The Bluemax Car Bluetooth + MP4 Player is the best way to pass time and lets you watch your favorite movies and TV shows on the go! Low price, ease of use, and amazing quality makes the Bluemax Car Bluetooth + MP4 Player great for personal entertainment or resale. Get your sample today, then order in bulk to enjoy even better discounts. Available in our warehouse now, order today and we'll express ship it out tomorrow. Brought to you by Chinavasion, the leader in car accessories and MP4 players. Note: The Bluemax Car Bluetooth + MP4 Player plays MP3/WMA music files and AMV video files. We recommend using software from www.s1mp3.org or the tool "MP3 Player Utilities 4.10" to convert your existing video media files into AMV format files. How do I store files onto this Bluemax Car Bluetooth + MP4 Player? Just insert a SD card that already has your favorite media it in or connect a USB cable and transfer them onto the Car MP4 Player's 2GB internal memory. Does this device have speakers? No. You can listen to audio through the built-in wireless earphone or by broadcasting to an FM channel.